Betty Blues Loungerie makes incredibly authentic vintage reproduction pieces in serious luxury fabrics – it’s impossible to not fall in love with the brand. I was lucky enough to pick up this robe and a set of pajamas from them in their sale earlier this year and they’re worth every penny. I love pretty slips and the lurex underlayer on this one is just wonderful. Lucy B makes lovely lingerie with pinup flair. 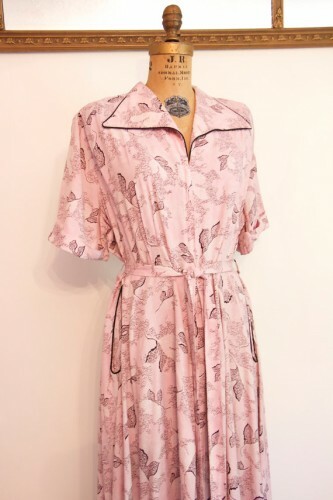 Trashy Diva always has the best vintage reproduction fabrics, so it’s great to see that they’re adding robes to their new line. 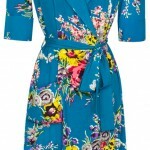 This turquoise floral is gorgeous in person, and I love this authentically 40’s style. Etsy has a great bunch of vintage sellers, many of whom go out of their way to find authentic vintage pieces in larger size ranges. 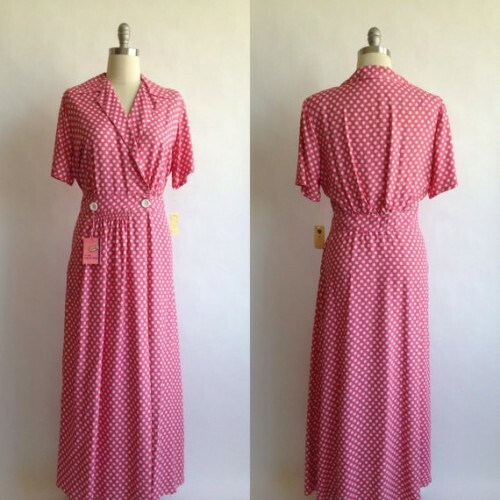 This beautiful housedress is a great example and it fits a modern XL! 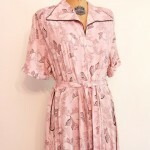 Another great housedress from Etsy in a larger size, this time in silk. 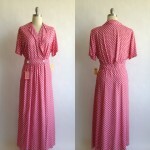 I love the cute little polka dots and the drape of this piece. Dollhouse Bettie has been putting out some amazing lingerie this year, but I’m particularly in love with their French Quarter line. I adore this vintage inspired waspie slip, but my favorite is this black lace robe inspired by a coat from 1915. I know lots of us have been watching Miss Fisher (season three is finally happening!) and this robe seems like a great way to channel her chic and unique style. Fringe never goes out of fashion. If you like smart ladies, literature and fashion then Blackbird Underpinnings is where you should be shopping. Their silk Coco Romper is inspired by the great fashion goddess Chanel herself. Their pieces are cut generously, which makes them perfect for those of us with a dramatic bust/waist difference. Which piece of vintage inspired lingerie is your favorite?